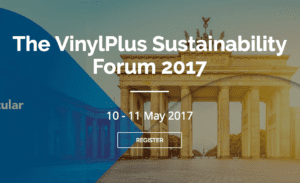 The fifth edition of the VinylPlus Sustainability Forum will take place on the 10th & 11th May 2017 in Berlin. This year’s forum will revolve around “Towards Circular Economy” and will look at the key sustainability challenges for PVC and the many growing opportunities for the industry to contribute to enhanced resource efficiency. Keynote addresses, presentations, speeches, panel and open discussions with high level speakers spanning the EU Institutions, UNIDO, NGOs, academia, politicians, PVC industry value chain, specifiers, designers and architects. followed by a Global Market panel discussion. There will be ample networking opportunities throughout the event, including our Welcome cocktail and buffet on 10th May from 19:30. The event will end with a “Networking Dinner” on the evening of the 11th May. We look forward to welcoming you at the VinylPlus Sustainability Forum and to sharing with you the progress our industry has made on the way to a sustainable future.